Daley Ranch is located in the northeastern portion of the City of Escondido, north of Dixon Lake and west of Valley Center Road. Access is provided via La Honda Drive to the south, Valley Center Road to the east, and Cougar Pass Road to the west. Daley Ranch is a 3,058-acre conservation area acquired in 1996 by the City of Escondido and is managed in perpetuity for the preservation of a biologically unique and diverse habitat area of regional importance. Visitors can enjoy a variety of recreational and educational opportunities and experiences in a historically significant setting. The property contains a number of natural vegetation communities including lush oak woodlands, coastal sage scrub and chaparral, grasslands, and riparian areas. Approximately 1.1 miles from the La Honda entry is the Daley Ranch House, a redwood barn, and numerous outbuildings of historical interest. Ranger-led tours of the Ranch House occur on the 2nd Sunday of every month from 11:00 a.m. to 2:00 p.m. Members of The Friends of Daley Ranch provide assistance with the tours, and offer additional insights into the history of the ranch. Please note that steady rain cancels the tours. Daley Ranch offers over 20 miles of multipurpose trails for hiking, mountain biking, and equestrian use. Six distinct trails cover most of the property. Most popular are the Boulder Loop Trail (2.4 miles) which affords outstanding views of Escondido, and the Ranch House Loop (2.5 miles), which passes two small ponds and the site of Daley's original log cabin. NOTES ABOUT PETS: Leashed dogs are allowed, and dog owners are required to remove pet waste. Bags and disposal containers are available along Ranch House Road, but please bring your own. Afternoons on the Ranch can be extremely hot, and the paved Ranch House Road can burn paws. Please take this into account when you bring your dog. Also, fresh water is in limited supply on the Ranch. Bring plenty of water for both you and your dog. NOTES ABOUT OFF-TRAIL TRAVEL: Rangers have noted a sharp increase in off-trail travel. Many hikers and cyclists have been warned regarding straying from marked trails, and Rangers have been directed to issue citations for blatant violations. The Escondido City Council has designated that violating Escondido Municipal Code Section 18-76 a misdemeanor. Please be mindful of your responsibility to help preserve Daley Ranch, and stay on marked and designated trails. If you have any questions about legal or illegal trails, or areas that are closed to public use, please contact a Ranger or staff at Dixon Lake Ranger station. The Caballo Trail from the staging area to the Sage Trail is in poor condition. Not recommended for equestrians or bicycles at this time. Use extreme caution on all other trails, as conditions change and trail treads deteriorate rapidly. Please check this page periodically for updates for trail detours and other sections of trails being closed for repairs. 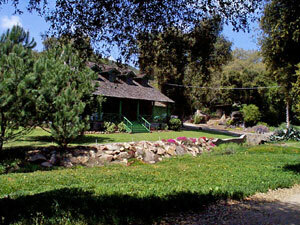 The main entrance is at the southernmost part of the property, just north of Dixon Lake at the top of La Honda Drive. Parking is available at the La Honda Drive entrance and within the adjacent Dixon Lake Recreation Area. The entrance to the northernmost part of the property is along the unimproved Cougar Pass Road, 0.5 miles south of Alps Way. From Escondido – Go north on Broadway to Cougar Pass Road. From Valley Center – Take Valley Center Road south approximately ¼ mile and turn right at Bevin Drive, then right again towards the humane society. Ample parking for equestrian trailers is available at the Valley Center Road entrance. For more information, contact the Dixon Lake Ranger Station at 760-839-4680.